The purpose of this Wiki post* is to maintain an active list of community based drivers that are currently running on the Hubitat Elevation platform. As you add new devices to your network that are NOT listed in the "List of Supported Devices" , please add them here to keep the Community up to date. See also, the Community Apps Wiki for a list community based applications. *Wiki posts can be modified by every member of our community, just click the "Edit" button located at the bottom of every Wiki post. Aeotec Garage Door Controller Gen5 (ZW062-A) - Using "Generic Z-Wave Garage Door Opener"
HomeSeer HS-WV100+ Wireless Z-Wave Plus Water Valve - Using "Generic Z-Wave Valve"
Kwikset Convert Z-Wave Smart Lock Conversion Kit (914 ZW500 CONVERT 15) using the "Z-Wave Generic Lock"
Leak Gopher Z-Wave Valve Control - Using "Generic Z-Wave Valve"
Just Starting - Smart product sources? Thank you for maintaining this list. It will be very helpful to new and existing users. Which driver should be used for the ST “Smart Outlet” Model number: F-OUT-US-2? It pairs as a “device” by default. I’m assuming “generic zigbee outlet” is probably the best choice? Does anyone know if the power meter works as well for this device? I can only confirm that the power meter reporting won't work if the Peanut Plug's firmware hasn't been updated. The Aeon micro switches are on the list, but has anyone tried the Aeon nano switches and/or dimmers? 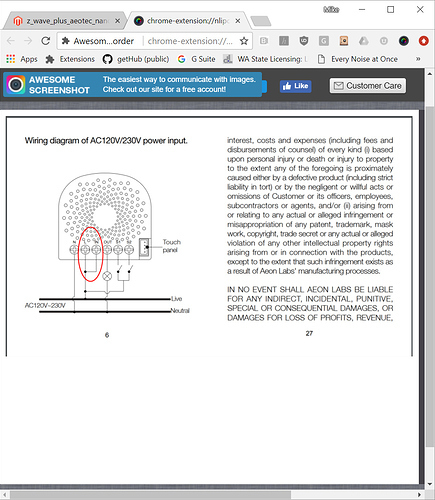 Yes they work with the generic zwave drivers, we don't have the fingerprints for them yet, so they will be discovered as a device, then you just change the driver. Thanks Mike. I can probably get you the fingerprints, as I have a couple in service on SmartThings and have another one in a box to add. What do you have in your house? I thought is was Nano switches, but obviously I'm mistaken. I'm using the micros, I have one nano i purchased for a fan that for whatever reason blew up 2 micros, but to be honest since they require an extra hot lead I don't like them. Not sure I understand what you mean by extra hot lead. Only one hot shown in the diagram here and the ability to work w/o neutral is a nice feature. I understand now. 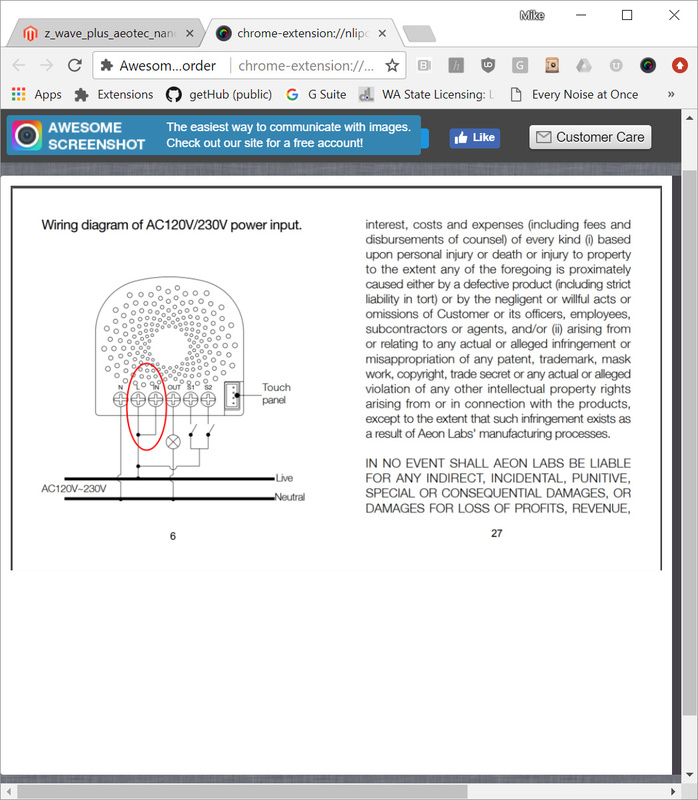 I was linked to the dimmer page, not the switch. Dimmer only needs two line inputs when a bypass is required, Now I see that the switch always does need two line inputs for 120~240v loads, because of their unique ability to handle a 24vdc load without requiring a different module that isn't backward compatible with mains voltages. I don't see aeotech smart switch 6 listed. I have a bunch of them, are they supported? I also don't see the new fibaro wall plug I have these as well. A smart outlet with power metering feature for electrical devices. Connect your home appliances into smart home world. 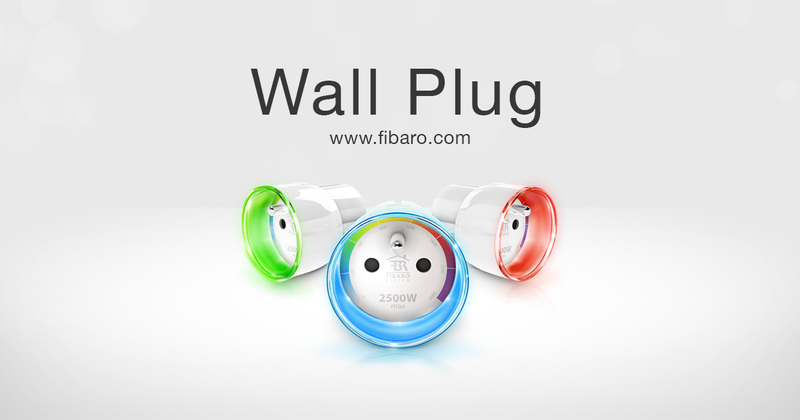 I am using a Fibaro wall plug FGWPB-121 about half way down the list. Sorry not home so I am not sure which DH I used. Thanks, it's listed as built in so I will give it a try. I missed that one. I got one last week and paired fine... as a device I believe. Tried the Aeon Outlet, didn't work. I also have the Dome Smart Switch and so I tried that DH on the Aeon... and it's working! It's on my washing machine to notify us of "Done". The Dome is on the dryer. Tried the Aeon Outlet, didn't work. Which model? Aeon and Aeotec are the same company so not sure which one you mean. The Dome is on the dryer.